This weekend was a whirlwind. . . I catered a brunch for 30, so I dropped off the food Saturday morning and then drove to Galveston with a friend to run in Beach Palooza! 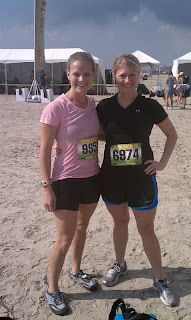 Beach Palooza is very similar to the Warrior Dash, Nate and I ran in earlier this year. . . but in sand! Needless to say, tonight, I wanted to make an easy dinner. . . So, I made Buttermilk Banana Pecan Pancakes annndddd. . . Nate LOVED them! In a bowl whisk together the flour, baking powder, baking soda and salt. In another bowl, mash bananas and whisk in the buttermilk, egg whites and vanilla. Whisk the dry ingredients into the liquid until well combined. Fold in the toasted pecans. Heat a non-stick pan over moderate heat. Working in batches, drop ¼ cup measures of batter onto pan to form pancakes and cook until bubbles appear on surface and undersides are golden brown, about 1 minute. Flip pancakes with a non-metal spatula and cook until undersides are golden brown and pancakes are cooked through, about 1 minute. banana pancakes are my fave!!! 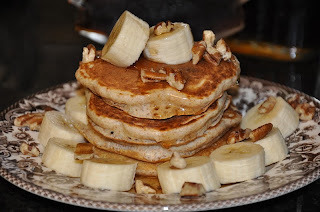 OMG banana pancakes are my very favorite!! Especially with peanut butter! Can't wait to make these! Just pinned them :) And totally loving that you use your china...I have the same, but it hasn't left my china cabinet!